I kept reading about a no-knead bread recipe on the web and I finally thought I'd give it a try. I initially used the recipe I found on the Fabulous Beekman Boys website. It was pretty good, but not exactly what I was hoping for. 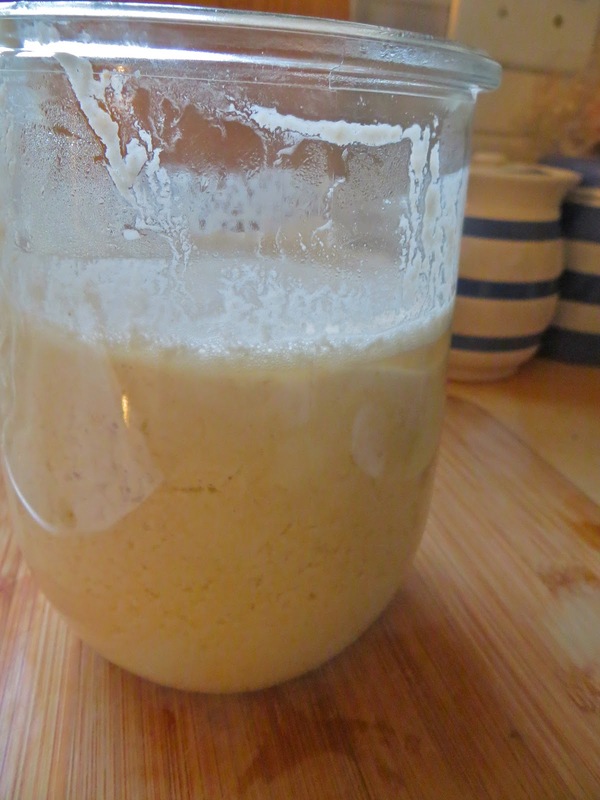 I decided that I wanted the bread to be a sourdough so I started looking for a recipe on the web for making my own sour dough starter. I found this one and tried it. It worked beautifully and now I have a batch of my homemade starter in the refrigerator, waiting to be used. I used half whole wheat flour and half bread flour when I made the starter. 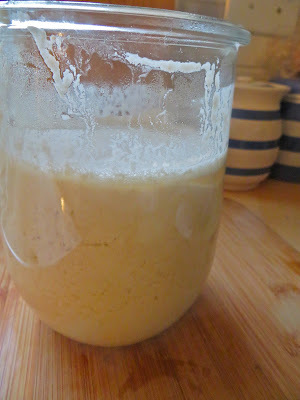 I use one cup of my sourdough starter and 1/4 tsp. of King Arthur yeast in my bread recipe. I mix up the flour I use depending on my mood. Sometimes it's all whole wheat, sometimes all bread flour or sometimes some of each. I haven't (yet) tried it with rye flour, but I don't think that would be a problem if you wanted to try it. This recipe is so darn easy and makes a nice, crusty loaf. 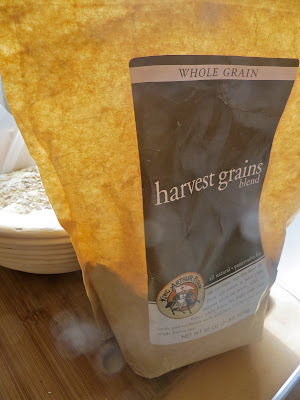 I love the Harvest Grains mix that I purchase from King Arthur Flour. I add a couple of handfuls to the bread when I mix it up, and I put a sprinkling on top of the bread when it is doing its second rise. I don't even bother with egg wash or water to hold it to the dough. By going through the second rise the mix of seeds seems to stick well enough to suit me. It makes a really lovely loaf. My DH and I love it and since I started making it, we haven't purchased any store-bought bread! This suits us just fine. Once it has finished the first rise, get a nice piece of parchment paper and sprinkle on some flour and some corn meal. Have handy a bowl to put the dough in for the second rise. This bowl should be approximately the same size as the Dutch oven you will use to bake the bread in. Let the dough fall onto the prepared parchment paper. Fold the dough over on itself by lifting the parchment paper from each side. (Lift the left side and fold the dough over about halfway on top of the dough. Then lift the right side over onto the dough.) Turn the parchment paper 90 degrees and fold both of the other two sides onto the dough. Now comes the only tricky part of the whole procedure---pickup the mound of dough and turn it over and sort of pat (squish) it into a roundish mound. Pick up the parchment paper and place the dough AND the paper into the bowl you have placed near by. Add the Harvest Grains, if using, to the top of the dough. Let the dough rise for 2 hours, uncovered. At the 90 minute mark, turn your oven to 450 degrees F. and heat the Dutch oven, with the lid, in the oven for the full 30 minutes. Once the oven is blisteringly hot and the dough has had a two hour rise, CAREFULLY* place the dough, parchment paper and all, into the Dutch oven and put the lid on. Place the Dutch oven CAREFULLY in the oven and bake for 25 minutes. Remove the lid CAREFULLY and bake the bread for another 7 to 12 minutes, until it turns a nice deep golden brown color. CAREFULLY remove the Dutch oven from the oven and CAREFULLY remove the bread from the Dutch oven. Check by tapping on the bottom of the loaf to see if it sounds hollow. If so, it's done. Cool completely on a rack. Everyone tells you not to cut into a hot loaf of bread. I am telling you not to cut into a hot loaf of bread. But you will, anyway. I do. It just smells so gooooood. And it tastes so good and butter melts into it so beautifully. Anyway, store it in a ziplock bag with all the air squished out. The loaf makes great toast. It keeps well. *Trust me. Be careful---I have the burn to show for being careless. Please don't burn yourself! I have been wanting to start making my bread again, thanks so much for this recipe! One question: is the bread very sour, or only a little?